Home / All TV Shows / Trapper John, M.D. When will be Trapper John, M.D. next episode air date? Is Trapper John, M.D. renewed or cancelled? Where to countdown Trapper John, M.D. air dates? Is Trapper John, M.D. worth watching? 28 years have passed since Trapper John (Pernell Roberts) was in Korea as a surgeon during the Korean War. Now, Trapper is working as the Chief of Surgery at San Francisco Memorial Hospital. 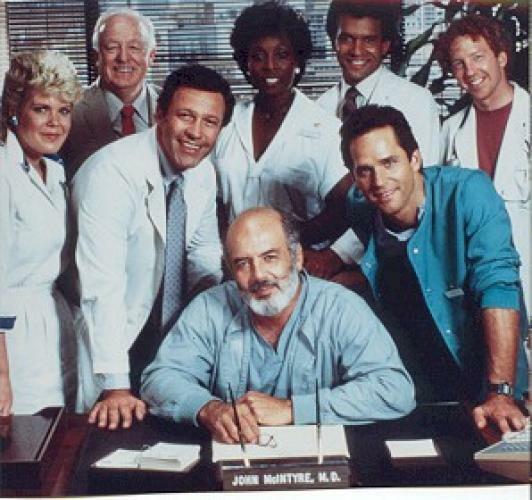 Alongside him are G. Alonzo Gates (Gregory Harrison), a former MASH surgeon as well; Dr. Stanley Riverside (Charles Siebert); Justin "Jackpot" Jackson (Brian Stokes Mitchell), an intern; as well as several nurses and other doctors. Here, Trapper takes his experiences from being in the line of fire, and applies them to the "calm" atmosphere of San Francisco Memorial. After seven seasons on the air, Trapper John, M.D. made its way into history by becoming the most successful M*A*S*H spin-off. EpisoDate.com is your TV show guide to Countdown Trapper John, M.D. Episode Air Dates and to stay in touch with Trapper John, M.D. next episode Air Date and your others favorite TV Shows. Add the shows you like to a "Watchlist" and let the site take it from there.